Patrick William Fitzgerald, Jr. (born (1974-12-02)December 2, 1974) is the current head coach of the Northwestern University Wildcats football team. He was selected after the unexpected death of Randy Walker and announced at a press conference on July 7, 2006. He was 31 making him at that time, the youngest head football coach in the Big Ten Conference and NCAA Division I FBS by five years. Fitzgerald starred at linebacker for the Wildcats in the mid-1990s, helping to lead the team to a 10–1 regular season record in 1995 and a berth in the 1996 Rose Bowl, the school's second ever bowl appearance and the first since 1949. Known as "Fitz" to the Northwestern faithful, he personified the Wildcats' blue-collar, opportunistic defense. He recorded eleven tackles in Northwestern's victory over then #9 Notre Dame in South Bend which was the first Wildcats' victory over the Irish since 1962. Against #7 Michigan, Fitzgerald led the defensive effort with 14 tackles (including two tackles for loss) in the Wildcats' 19-13 win, the first for Northwestern in Ann Arbor since 1959. At one point during the 1995 season he was averaging over 13 tackles a game while on his way to Consensus All-America honors. Fitzgerald was unable to play in the Rose Bowl, however, after breaking his leg in the next-to-last game of the 1995 season against Iowa. Fitzgerald returned for the 1996 season, leading the Wildcats to a 9-3 overall record, a second straight Big Ten Championship and second consecutive New Year's Day bowl, the 1997 Citrus Bowl. The Wildcats struggled in Fitzgerald's first season as head coach going only 4-8 overall and 2-6 in the Big Ten. The 'Cats improved to 6-6 the following year before going 9-3 in the 2008 regular season (5-3 in conference play) and playing in the Alamo Bowl. After the season, Fitzgerald was named the Big Ten Coach of the Year by the Touchdown Club of Columbus. The 2009 season saw the Wildcats go into Iowa City and knock off Iowa 17-10 on November 7. The win over Iowa came when the Hawkeyes were ranked #4 in the BCS standings and is, to date, the highest ranked opponent ever defeated by a Fitzgerald coached team. Two weeks later, the Wildcats knocked off #14 Wisconsin in Evanston for the second upset win of the season. Northwestern finished off the '09 campaign with a thrilling game in the 2010 Outback Bowl that saw Wildcat quarterback Mike Kafka set not only school records with 47 completions on 78 attempts for 532 passing yards but set all-time all-bowl records in those categories as well. The Wildcats fell 38-35 in overtime to Auburn (who would win the BCS Championship the following season) when a fake field goal attempt fell short. Nearly six million viewers watched the Wildcats play in their first New Year's Day bowl since 1996 in one of the most entertaining games of the 2009–2010 bowl season. The Wildcats' winning ways under Fitzgerald continued in 2010, highlighted by a dramatic last minute 21-17 upset of then #13 Iowa en route a third straight winning season and a third consecutive bowl game. In 2011, the Fitzgerald-led Wildcats defeated #9 Nebraska in Lincoln 28-27 with back-up quarterback Kain Colter guiding the Wildcats in the second half. Fitzgerald became only the second coach in school history to coach two nine-win Wildcat teams during the 2012 campaign that saw the 'Cats go 9-3 in the regular season and 5-3 in the Big Ten. Northwestern played in the third New Year's Day bowl game under Fitzgerald when the team accepted an invitation to play in the 2013 Gator Bowl. Fitzgerald then guided the Wildcats to their first bowl victory in sixty-four years when he led Northwestern to a 34-20 victory over Mississippi State in the Gator Bowl. The '12 team finished the season with a 10-3 record which tied the 1995 and 1903 teams for the most wins in school history. The 2013 campaign started with high expectations for the Wildcats and hopes of contending for a conference title. The 'Cats started the season ranked #22 in the pre-season AP poll and roared to a 4-0 start. ESPN College GameDay came to Evanston for the first time since 1995 as the #18 Wildcats took on the #4 Ohio State Buckeyes on national television. A controversial fourth down call that saw the officials rule that 'Cats quarterback Kain Colter was stopped when replays indicated Colter had made the line to gain proved pivotal in the 38-30 defeat. The season began to be marred by injuries as All-American Venric Mark and quarterback Kain Colter missed significant playing time with injuries. The Wildcats then dropped four consecutive games that could have just as easily been won. First, NU dropped a 20-17 game against Minnesota, then the 'Cats lost 17-10 to Iowa in overtime. Perhaps the most bitter loss of the season came at Nebraska when the Huskers converted a Hail Mary touchdown pass as time expired to win the game. The following week the 'Cats clung to a 9-6 lead over Michigan when the Wolverines ran their field goal team on with seconds to play; Michigan converted the field goal and won in triple overtime. Northwestern ended a disappointing season with a win however: a 37-34 victory over rival Illinois. The 2013 team finished 5-7, Fitzgerald's second losing campaign since his inaugural season as the Wildcats head coach. In 2014, the Wildcats entered the year having lost two major weapons from seasons past: All-American Venric Mark transferred and leading wide receiver Christian Jones was lost to a season-ending knee injury. The 'Cats started 0-2 with a loss to MAC power Northern Illinois before ripping off three straight wins. After back-to-back blowout losses to #19 Nebraska and Iowa the Cats had a chance to knock off Michigan at home. Late in the game, Trevor Siemian threw a touchdown pass with three seconds left to pull the 'Cats within one at 10-9. Coach Fitzgerald decided to go for the two point conversion and the win but Sieman slipped after taking the snap and was downed by the Wolverines, ending the game with another loss. The highlight of the season came the following week however when Northwestern returned to South Bend for the first time since 1995 to take on the #18 Notre Dame Fighting Irish. Siemian threw for 284 yards and freshman Justin Jackson rushed for 149 yards and a score as the 'Cats scored 10 points the final four minutes to tie the game with seconds remaining. In overtime, Northwestern held the Irish to a missed field goal try before Wildcats kicker Jack Mitchell hit his fourth field goal of the game to give the 'Cats a 43-40 overtime victory. After a lopsided win the following week against Purdue the 5-6 'Cats played Illinois for a chance to return to a bowl game. The Wildcats came out flat in the game and the Illini raced to a 47-33 victory that kept the 'Cats home for the holidays for the second straight year. 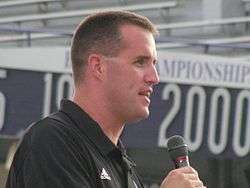 Pat Fitzgerald is the all-time winningest coach in Northwestern football history with 70 wins. His 36 Big Ten conference wins are the most in school history. He has led the Wildcats to five consecutive bowl appearances including three games played on New Year's Day. He is one of only two coaches in school history to lead Northwestern to a bowl game victory. Fitzgerald is one of only three coaches in school history to guide Wildcat football teams to three consecutive winning seasons and the first since Ara Parseghian coached the Wildcats to winning years from 1958–1960; Fitzgerald's .560 winning percentage at NU is also the highest since Parseghian. Fitzgerald resides in Northfield, Illinois with his wife, Stacy, and three sons, Jack, Ryan, and Brendan. He purchased a $2.3 million newly constructed home in January 2010. A born and bred Chicagoan, Fitzgerald is a huge fan of the area pro sports teams often using his Twitter feed to support the Bears, Blackhawks and White Sox. While Fitzgerald has led the Wrigley Field crowd in the iconic "Take Me Out to the Ballgame" song during the seventh inning stretch of a Cubs game, as a South Sider he is a die-hard White Sox fan. Fitzgerald signed a ten-year contract extension with Northwestern before the 2011 season. While Northwestern, as a private institution, is not required to release compensation figures the school's tax data released in 2013 shows that Fitzgerald earned $2.2 million in 2011; he is widely believed to be the university's highest paid employee. ↑ "NU picks Fitzgerald". Chicagosports.chicagotribune.com. 2012-09-22. Retrieved 2012-09-28. ↑ "Pat Fitzgerald Earns Football's Pinnacle Achievement: College Hall of Fame Induction – NUSPORTS.COM – The Northwestern Official Athletic Site". Nusports.cstv.com. Retrieved 2012-09-28.